We drop huge banner and thousands of oil drops in BP Russia protest – BP or not BP? At 2.15pm today, performers from the activist theatre troupe BP or not BP? dropped a floor-length banner from an eleven-metre-high balcony inside the British Museum and filled the air with floating “oil drops”, in protest at the museum’s partnership with the oil giant BP. The banner read “BP in Russia: how many oil spills is too many?”, above a thermometer-style image showing a total of 2,727 oil spills – the amount caused by BP’s Russian partner Rosneft in a single region in just one year. The eleven-metre banner descended from the balcony in front of the main entrance, in front of hundreds of museum-goers – some of whom cheered and applauded. The banner remained there for an hour. One of the people holding the banner was Phil Ball, an activist who in 2013 was illegally imprisoned – along with 29 others – by the Russian government for more than two months after taking part in a Greenpeace protest on an Arctic oil rig. The performers also scattered over 2000 black paper oil drops into the Great Court, in a series of drops from the balcony, each one representing a Rosneft/BP oil spill in Russia. In addition to the crowd of watching adults, a large group of children immediately ran over to dance in the tumbling paper. Some of the children then took oil drops with them for their school’s ‘show and tell’. Over thirty million barrels of oil are spilled by the oil industry in Russia every year, the majority by Russian state oil company Rosneft. This is equivalent to seven Deepwater Horizons per year. Many of these spills are in Indigenous territories, with devastating impacts on water, lands, health, livelihoods and wildlife; thousands of incidents are not officially recorded by oil companies or the state. This lack of scrutiny greatly benefits BP, as the company obtains a third of all its oil and gas from Russia, through a 19.75% stake in Rosneft. Western economic sanctions targeting the oil industry are hampering BP’s activities in the region, including efforts to drill in the Arctic, and BP has been actively lobbying governments in an attempt to water down these sanctions – helped, in part, by the British Museum. Today’s performance marks the end of the British Museum’s blockbuster exhibition ‘Scythians: Warriors of Ancient Siberia’, which is sponsored by BP in partnership with the Russian State Hermitage Museum. This arrangement provided BP with valuable lobbying and networking opportunities with British and Russian government officials . At the exhibition’s launch last year, the Russian Ambassador, staff from BP and the British Museum director enjoyed a private meeting before they greeted members of the press . Helen Glynn, who took part in the performance, said: “BP is the second largest stakeholder in Rosneft after the Russian government. Two BP executives, including its CEO Bob Dudley, sit on Rosneft’s Board of Directors, and the companies have major joint extraction projects across Russia. BP is deeply embedded in this Russian oil giant, which is well-known as one of the most corrupt and polluting in the world. So why has the British Museum allowed BP to sponsor an exhibition of artefacts from the very regions and cultures that the company is putting at risk? During today’s performance, 500 flyers were distributed to museum-goers. These flyers included a letter to British Museum Trustees for visitors to sign, calling for an end to the BP deal. Many visitors did indeed sign this letter and handed it in to museum staff. At the end of the performance, the group gathered up the oil drops and symbolically removed them from the museum. This is the fourth protest performance to target the BP-branded Scythians exhibition during its four-month run. Firstly, at the press launch in September 2017, BP or not BP? set up a spoof BP stall to greet journalists at the exhibition entrance. In October, the group were joined by US performance activists Reverend Billy and the Stop Shopping Choir who held a “Ritual for the Permafrost” inside the museum. This referred to the fact that many items in the exhibition came from the Russian permafrost, which is threatened by the climate change from BP’s activities. Despite the huge threat that it poses to the future of Scythian archaeology, climate change is not mentioned at all in the oil-sponsored exhibition, a fact that the performers find “deeply suspicious”. In December, BP or not BP? returned to this theme with a 100-person ice-themed “freezemob” that left huge paper “permafrost cracks” across the museum floor. Today was the latest action in the ongoing campaign against oil sponsorship of the arts which has seen recent actions in London, Amsterdam and Paris. 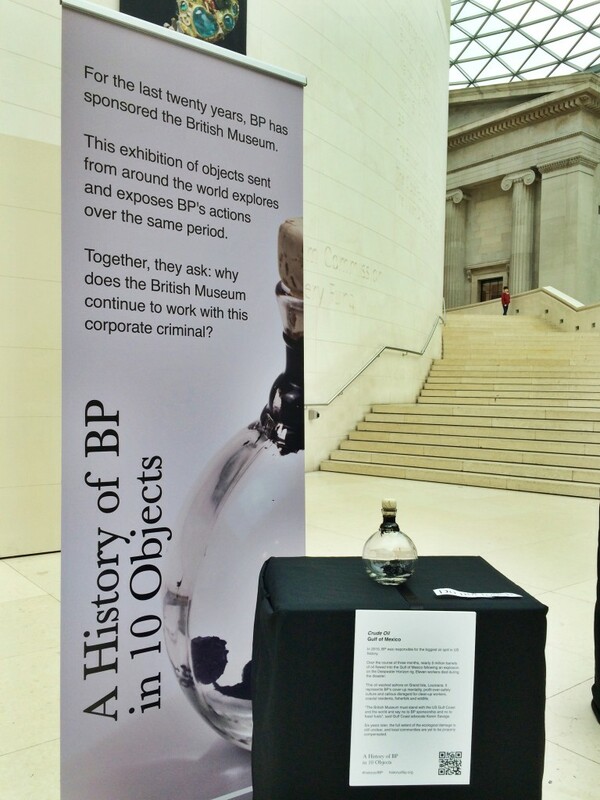 It was the forty-ninth performance by BP or not BP?, and their thirty-first intervention in the British Museum since 2012. We are grateful to X Minus Y for their generous support for this action.